In the last newsletter we introduced a numerical modeling of a relatively new sputter-deposition technique: the modulated-transit process (Vernon and Ceglio 1996; Spiller et al 2001). We showed that extraordinary thickness uniformity can be maintained when the vapor plume of a sputtering source changes due to target erosion. Here, we show an (adverse) effect of employing chimneys in the modulated-transit technique. While chimneys can have positive impacts in sputter deposition, their use in the modulated-transit process can cause an unwanted effect: thickness ripples across the substrates, a phenomenon noted by the inventors of the technique. We will examine the origin of the ripple and possible ways to alleviate it. A chimney can be modeled as a negative mask in V-Grade 5S: an aperture that allows passage of vapor in a designated area. We place a chimney with a beveled rectangular opening in front of the target, as shown in the diagram below. 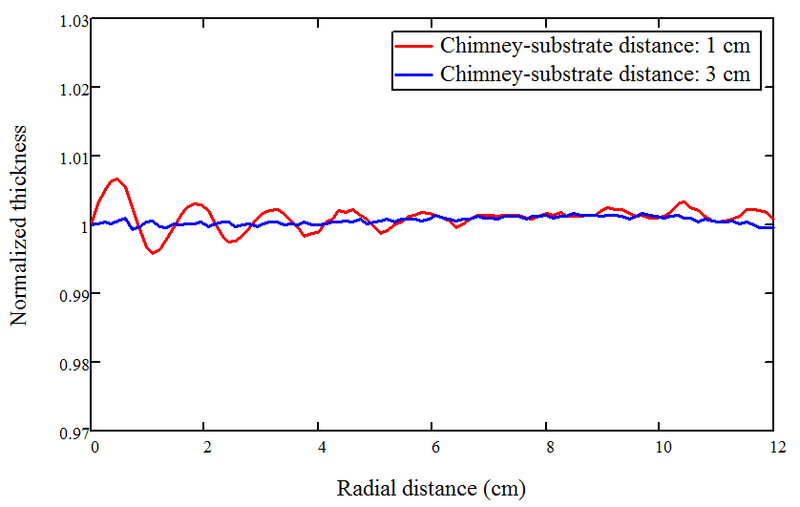 Two effects of the chimney are immediately obvious: 1) an overall thickness slope in a radial direction emerges; and 2) a very noticeable ripple in the thickness across the substrate. The overall slope can be eliminated by re-optimizing the power profile (or the speed profile). 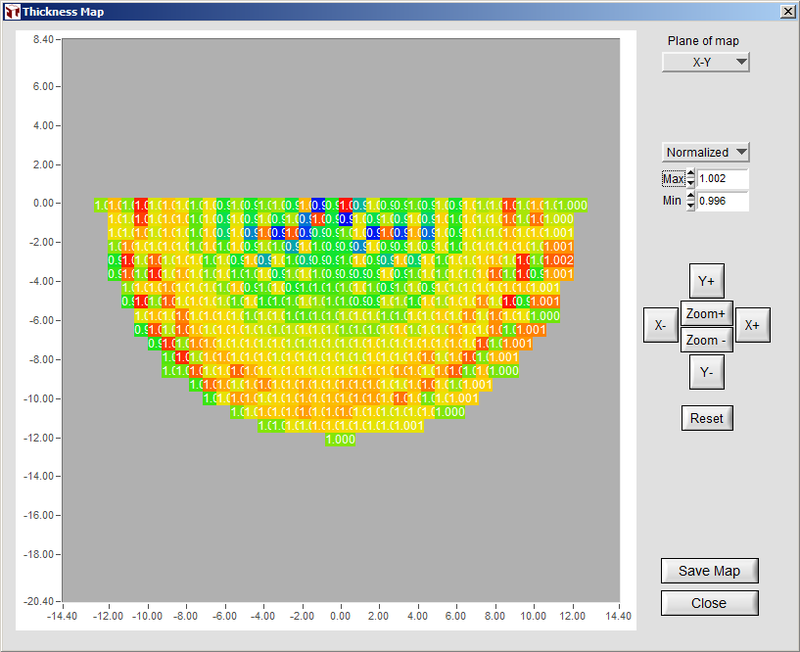 The thickness ripple, on the other hand, beckons further investigation. With V-Grade 5S, it can be shown that the time a surface point spent in the chimney aperture is dependent on the radial position with a rippled appearance. The thickness ripple is the consequence of this ripple in exposure time to vapor in the presence of the chimney. This ripple in thickness is strong when 1) the spin speed of the substrate is low; 2) the chimney is strongly vapor constrictive; and 3) the chimney opening is close to the substrate. The figure below compares the thickness ripples along a substrate radius for two chimneys: a tall one whose opening is 1 cm below the substrate surface, and a shorter one whose opening is 3 cm from the substrate. A close examination reveals that the thickness ripple is not simply radial: the magnitude of the ripple varies with the azimuth angle of the substrate, as shown in the thickness map below. This is easy to understand because the vapor exposure time of a radial position also depends on the spinning angle at which it enters the deposition zone. It is now clear that the use of chimneys or apertures, in the modulated-transit process, can cause significant thickness ripples. If a chimney is necessary, it is preferable to use one that maintains a large distance from the substrate. In addition, high spin speed of the substrate also helps to reduce the ripple. (A ratio of 200 is assumed between the angular velocities of the spin and the orbiting for all the numerical results here.) Many other aspects of the deposition process can be conveniently analyzed and optimized with the help of V-Grade 5S. For further information or comments please contact Tin Model. © 2018 Tin Model LLC, 2285 Massachusetts Ave.